A UNIT OF DISTANCE used primarily at sea and in aviation, the nautical or sea mile is based on the average meter distance on the Earth’s surface represented by one minute of latitude. Because it is based on the earth’s dimensions, the nautical mile is extremely convenient to use for any type of navigation. Adopted in 1954 by the U.S. Secretary of Commerce and the Secretary of Defense, and used in maritime and aerial navigation, in relation to how boat speeds and wind velocities are measured (one knot is one nautical-mileper-hour), a nautical mile is approximately one minute of latitude and it is used to express distance. The nautical mile, which is outside of, but accepted by, the International System of Units (SI), the modern version of the metric system, was for years established by Britain at 6,080 ft or 1853.18 m. There is no internationally agreed symbol for the nautical mile. A nautical mile is approximately a minute of arc (a unit of angular measurement equal to one sixtieth of one degree) along a great circle of the Earth. 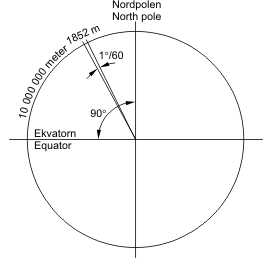 That is, if the Earth was sliced into two equal halves through the center along the equator and then divided along the perimeter into 360 degrees, and each degree into 60 arc minutes, the result (although the Earth is not a perfect sphere) would be close to one nautical mile. At sea level one minute of angle equals 1.15 miles or one nautical mile. As such, the nautical mile differs slightly from definitions of other miles including the international nautical mile, which was adopted by the International Extraordinary Hydrographic Conference in 1929 at exactly 1,852 meters. Around since the time of the Roman Empire, the term mile had many meanings over the centuries. The Roman mile was 5,000 ft in length or 1,479 m in modern dimensions. Most people are more familiar with the land or international mile. Used in the United States and Britain as part of the imperial system of units, the land mile is defined, by a 1959 international agreement, to be exactly 5,280 international ft or 1,609.344 m. The United States makes use of the statue mile, which was adopted by Congress before the international nautical mile was established. The statue mile, derived from U.S. geodetic surveys after the adoption of the international mile and used by the U.S. Coast Guard, is one-quarter inch longer than the international nautical mile at 5,280 ft. The geographical mile, a unit of length determined by one minute of arc at 6,087.15 ft, is also closely related to the nautical mile. Nautical miles are also related to speed in that the nautical mile and the knot, a unit of speed equal to 1 nautical mile per hour (1,852 m), are the bases of sea and aerial navigation. During the days of wooded boats, sailing speed was calculated by unraveling a knotted rope into the water behind the ship. The number of knots that passed over the side of the ship during a given time (most ships during this time used a 28- second sand hourglass) would indicate how fast the ship was traveling. Today, aircraft velocity gauges and flight routes are calibrated and denoted in knots and nautical miles.